Of all the Olympic competitions, the race for offshore wind capacity is perhaps the most dramatic and important. OK, perhaps that is a bit of an exaggeration if not all-out fabrication. Yet there is a bit of truth in the headline, the UK really has beat every other country in this metric. Not only do they have more offshore wind power than any other country, they have more than all other countries combined. Recognizing the fact that they have more shore than most countries, it is still an achievement given the sheer volume of people and industries with stakes in the regional waterways. Several industries care very much about the water surrounding the UK including shipping, transportation, real estate and others. 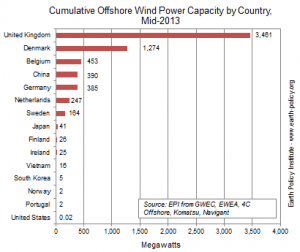 So why offshore wind? UK’ers have consistently resisted wind development on land. At the same time, EU laws require a target of 30 percent clean energy by 2020. A goal the U.S. could learn something from. The UK also has weather patterns that support wind energy that rivals that of solar technology. Anywhere on a major coast tends to have higher winds and as already stated, the UK has quite a bit of coast. It’s an island after all. Their shorelines are also peppered with shallows, allowing relatively simple construction of giant turbines. Three cheers (or should I say “cheer-e-o”?) for the UK! Right? Pump the brakes. Let’s not put all our eggs in this basket since it currently requires a great deal of government subsidy to work. Offshore wind is clean, but is also one of the most expensive forms of clean energy we have at our disposal. Some of the factors that add to the expense are giant waves, WWII era bombs and sharks. Yes, all three have posed problems for recent projects. I’m not in favor of stripping mountain tops for wind turbines either. I’m more of a solar guy myself.